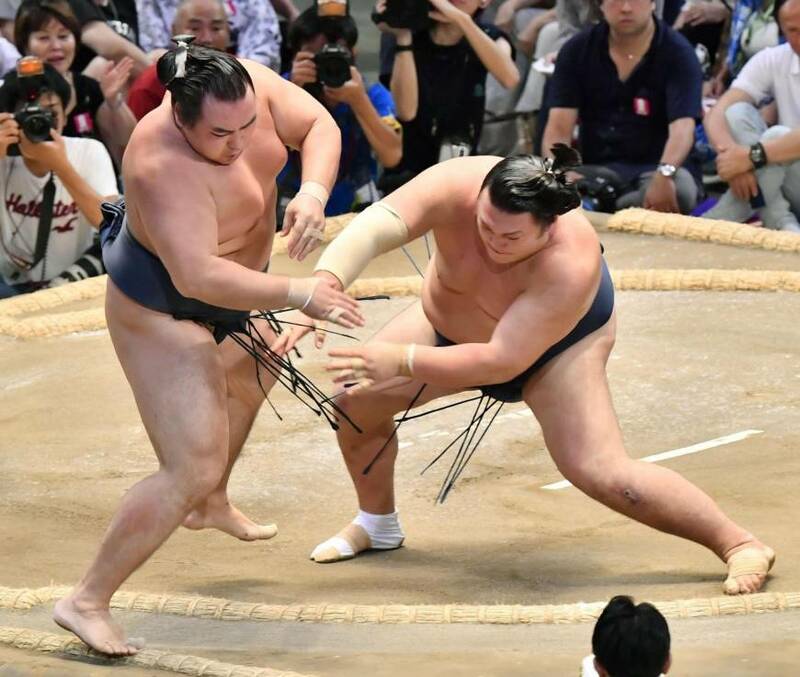 NAGOYA - Yokozuna Kakuryu suffered his first defeat after an upset loss to Ikioi on Wednesday, the fourth day of the Nagoya Grand Sumo Tournament. Kakuryu (3-1) was immediately pushed onto the back foot by the No. 2 maegashira and was unable to recover against a relentless charge from Ikioi (1-3) that forced the yokozuna over the straw. “I really concentrated and was able to get the win. I didn’t really have a plan, I just wanted to go all out in the ring. I’ll keep giving it my all for the rest of the tournament,” said Ikioi, who picked up his fifth kinboshi prize for the win. Kakuryu, aiming for a third straight championship, is the only remaining yokozuna in competition at Dolphins Arena following Hakuho’s withdrawal due to a right knee injury before the start of Wednesday’s bouts. Tochinoshin (4-0) earned his fourth straight victory as a debut ozeki with a win over Abi (1-3) and is now one of only two undefeated wrestlers. The No. 3 maegashira had the Georgian briefly on the ropes before Tochinoshin attempted to lift Abi up by the belt, eventually pushing him out. Top-ranked maegashira Kotoshogiku (1-3) handed ozeki Goeido (2-2) a second loss and earned his first victory. Goeido narrowly recovered from being pushed from the ring, but Kotoshogiku kept on the ozeki’s heels and slapped Goeido down as he slipped. 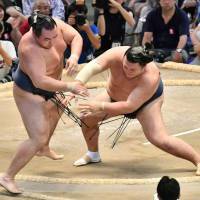 Meanwhile, Takayasu (3-1) was able to easily thrust out No. 1 east maegashira Shodai (1-3) for a third win. Sekiwake Mitakeumi (4-0) remains the only other undefeated wrestler here after quickly dispatching komusubi Tamawashi (1-3). Mitakeumi improved to 12-2 over the Mongolian, who is aiming for another promotion since losing his sekiwake status after going 9-6 at the New Year meet. Komusubi Shohozan (1-3) edged out sekiwake Ichinojo (1-3) for his first win despite an 84-kg weight disadvantage. The 225-kgMongolian rebounded against Shohozan’s fast initial charge but was pushed out on the komusubi’s second attempt. The three lower-ranked wrestlers who went into Day 4 unbeaten — No. 6 Endo, No. 9 Myogiryu, and No. 13 Asanoyama — all suffered their first defeats.